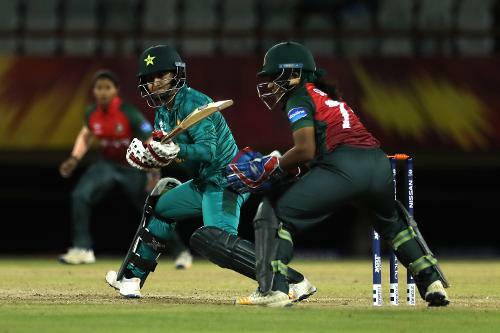 Bismah Maroof of Pakistan plays a reverse sweep as Shamima Sultana of Bangladesh looks on during the warm up match between Bangladesh v Pakistan: Warm Up - ICC Women's World T20 2018 November 6, 2018 at the Guyana National Stadium in Providence, Guyana. 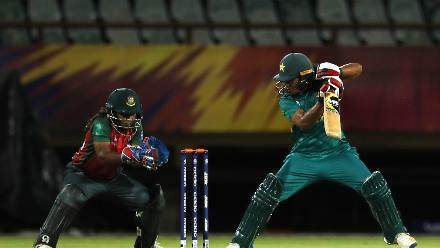 Lata Mondal of Bangladesh during the warm up match between Bangladesh v Pakistan: Warm Up - ICC Women's World T20 2018 November 6, 2018 at the Guyana National Stadium in Providence, Guyana. Ayesha Zafar of Pakistan cuts as Shamima Sultana of Bangladesh looks on during the warm up match between Bangladesh v Pakistan: Warm Up - ICC Women's World T20 2018 November 6, 2018 at the Guyana National Stadium in Providence, Guyana. 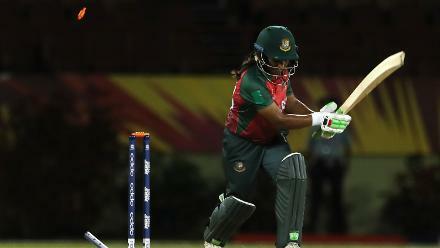 Bangladesh celebrate the run out of Nahida Khan of Pakistan during the warm up match between Bangladesh v Pakistan: Warm Up - ICC Women's World T20 2018 November 6, 2018 at the Guyana National Stadium in Providence, Guyana. Nahida Khan of Pakistan is run out by Lata Mondal of Bangladesh as teammate Jahanara Alam looks on during the warm up match between Bangladesh v Pakistan: Warm Up - ICC Women's World T20 2018 November 6, 2018 at the Guyana National Stadium. Ayesha Zafar of Pakistan avoids getting stumped by Shamima Sultana of Bangladesh during the warm up match between Bangladesh v Pakistan: Warm Up - ICC Women's World T20 2018 November 6, 2018 at the Guyana National Stadium in Providence, Guyana. Jahanara Alam of Bangladesh bowls during the warm up match between Bangladesh v Pakistan: Warm Up - ICC Women's World T20 2018 November 6, 2018 at the Guyana National Stadium in Providence, Guyana. Pakistan celebrate as Aiman Anwer (C) picks up a wicket during the warm up match between Bangladesh v Pakistan: Warm Up - ICC Women's World T20 2018 November 6, 2018 at the Guyana National Stadium in Providence, Guyana. Aiman Anwer and Umaima Sohail of Pakistan celebrate during the warm up match between Bangladesh v Pakistan: Warm Up - ICC Women's World T20 2018 November 6, 2018 at the Guyana National Stadium in Providence, Guyana. Ayasha Rahman of Bangladesh is bowled by Aiman Anwer of Pakistan during the warm up match between Bangladesh v Pakistan: Warm Up - ICC Women's World T20 2018 November 6, 2018 at the Guyana National Stadium in Providence, Guyana. 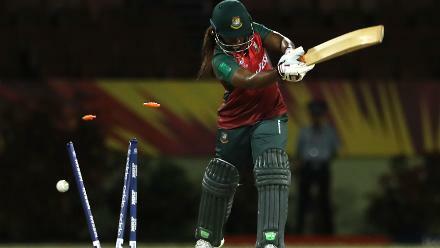 Shamima Sultana of Bangladesh is bowled by Aiman Anwer of Pakistan during the warm up match between Bangladesh v Pakistan: Warm Up - ICC Women's World T20 2018 November 6, 2018 at the Guyana National Stadium in Providence, Guyana. 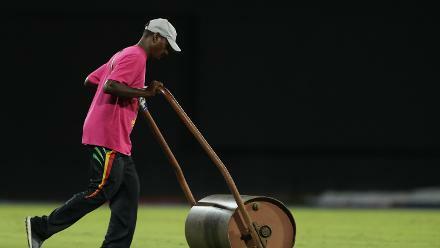 A member of the ground staff pushes out the light roller during the warm up match between Bangladesh v Pakistan: Warm Up - ICC Women's World T20 2018 November 6, 2018 at the Guyana National Stadium in Providence, Guyana. 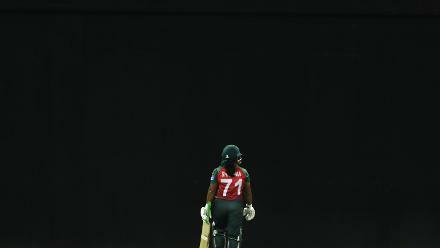 Shamima Sultana of Bangladesh is dismissed during the warm up match between Bangladesh v Pakistan: Warm Up - ICC Women's World T20 2018 November 6, 2018 at the Guyana National Stadium in Providence, Guyana.